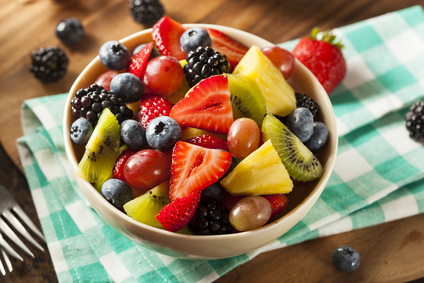 Fresh fruit salad has for decades been on British hotel breakfast menus. I recently remembered I saw it on a menu in Jersey once, and this made me think how different cultures use fruit in their proverbs and figures of speech. The proverbial ‘cherry picking’, which is increasingly used as a loan word in German (as this example shows), i.e. the act of selectively considering only information which serves a certain purpose and thus taking the best bits of something, is referred to in German as ‘raisin picking’ (sich die Rosinen herauspicken). A similar turn of phrase in English is ‘to have your cake and eat it (too)’, i.e. to have the best of both worlds. In German, one could say something along the lines of auf zwei/allen Hochzeiten (gleichzeitig) tanzen. In German, cherries are usually mentioned in relation to neighbours (die Kirschen in Nachbars Garten sind süßer), to which situation Englishpeople would say the grass is always greener (on the other side (of the fence)). However, if someone is a moper, we say mit dem ist nicht gut Kirschen essen. Speaking of fruit-bearing trees in gardens, apples are a popular subject in turns of phrases. In German, when faced with a difficult situation but having to endure it, you ‘bite the sour apple’ (in den sauren Apfel beißen). In English, you ‘bite the bullet’ or ‘grasp the nettle’ (ouch!). In both languages, you can’t ‘compare apples and pears’ (Äpfel mit Birnen vergleichen), the equivalent in non-British English being ‘apples and oranges’. ‘Apples and pears’, though not actually used much these days, is also one of the flagship examples of Cockney Rhyming Slang (see earlier blog post ‘Poesie made in London’). If you are making a great bargain in German, you buy something ‘for an apple and an egg’ (für’n Appel und ‘n Ei), in English it is ‘cheap as chips’ (in US American English ‘a dime a dozen’). In England, ‘an apple a day keeps the doctor away’. If you are insinuating that a daughter is very much like her mother, the German and English sayings are similar: der Apfel fällt nicht weit vom Stamm (‘the apple does not fall far from the trunk’) and ‘the apple never falls far from the tree’. However, ‘like mother, like daughter’ is also commonly used. Oh, we could go on for ages dwelling on the sheer abundance of fruit and vegetable-related utterances. Let me finish with some of my personal favourites. The second one, using the same fruit (someone told me once that tomatoes are fruit and not vegetables – no clue if that’s true or just an alternative fact), could be a door-opener at the Ausländerbehörde, where most of you poor Brexit-beaten bastards are presently queuing for German citizenship. If you can squeeze that one in, they will let you go without a language test for sure. Just say something like, ‘Ich glaub’ ich hab’ Tomaten auf den Augen. Ich konnte Zimmer 305 nicht finden.‘ That’s it. You must be German! Come into my arms, son! Here, have a piece of Blutwurst! And finally, numbers three and four are English expressions referring to a person who behaves in a rather strange or crazy manner: ‘nutter’ and, turning full circle back to fruit salad, ‘fruitcake’. So enjoy your fruit salad, or fruitcake, whichever it may be, and feel free to contribute more in the comments section below. The Pommes Buddha says: Do you have beans in your ears?